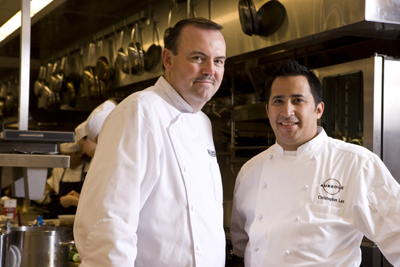 Charlie Palmer and Executive Chef Christopher Lee. Photo by:Pete Thompson. Grand Opening of the New Aureole. Charlie Palmer and Executive Chef Christopher Lee host a gala dinner and cocktail party to celebrate the grand opening of the new Aureole. The evening will benefit Citymeals-on-Wheels. The intimate gala dinner, taking place in the formal dining room, will include a sparkling wine reception and adventurous tasting menu highlighting new fall dishes. A cocktail party with hors d’oeuvre from the new fall menu, decadent desserts and drinks will immediately follow. Raffle tickets for a chance to win priceless experiences are available for purchase in advance and during the event. ABOUT CITYMEALS-ON-WHEELS: Founded in 1981, Citymeals-on-Wheels is a not-for-profit organization and public-private partnership with the New York City Department for the Aging that raises private funds to prepare and deliver weekend, holiday and emergency meals to the homebound elderly throughout the boroughs of New York City. Last year, Citymeals underwrote the preparation and delivery of 2.1 million meals to 17,000 aged New Yorkers. One hundred percent of donations from the public to Citymeals goes toward the preparation and delivery of meals for homebound elderly. For more information, visit www.citymeals.org.